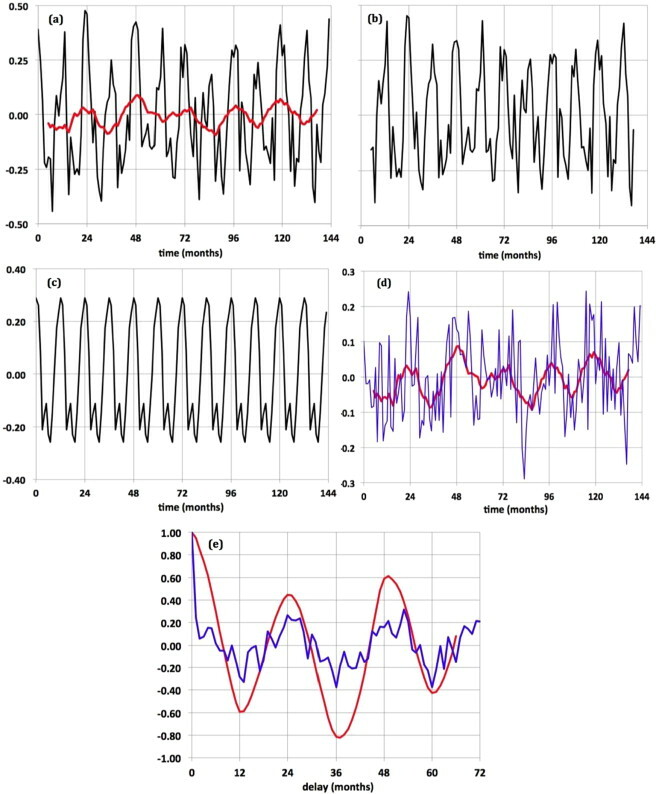 Two new papers published in Physics Letters A find the Sun is the "climate pacemaker" of both the equatorial and global ocean temperatures. 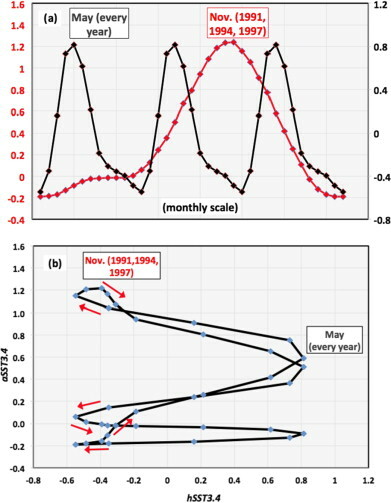 The authors find evidence of an annual solar forcing that is "phase-locked" to cycles in ocean temperatures of 2 or 3 year periods. 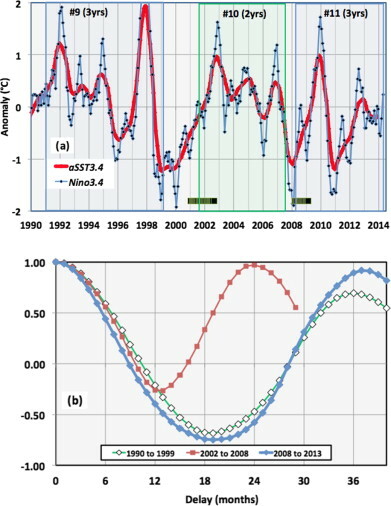 The authors also find these solar forcing cycles "to be significant for understanding the El Niño/La Niña phenomenon," which in turn has profound effects upon global climate (and could represent another solar amplification mechanism). "equatorial Pacific Ocean temperature index SST3.4 was found to have segments during 1990–2014 showing a phase-locked annual signal and phase-locked signals of 2- or 3-year periods. Phase locking is to an inferred solar forcing of 1.0 cycle/yr. Here the study extends to the global ocean, from surface to 700 and 2000 m. The same phase-locking phenomena are found. 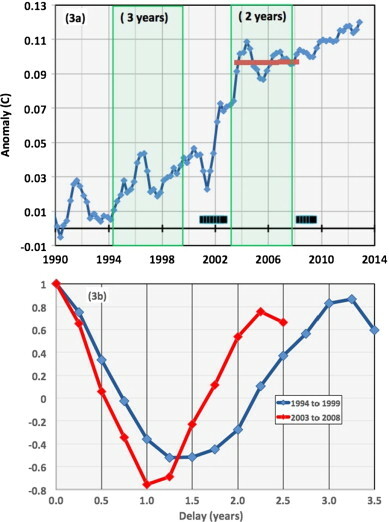 The El Niño/La Niña effect diffuses into the world oceans with a delay of about two months." Central Pacific region temperature dataset SST3.4 from 1990 to 2014 is studied. 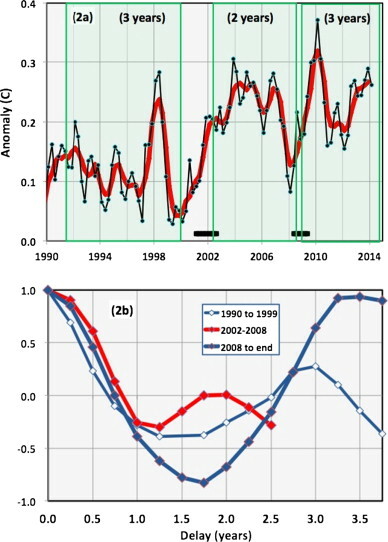 SST3.4 contains a sustained signal at 1.0 cycle/yr implying solar forcing. This signal contains segments of period 2 or 3 years, phase locked to the annual. 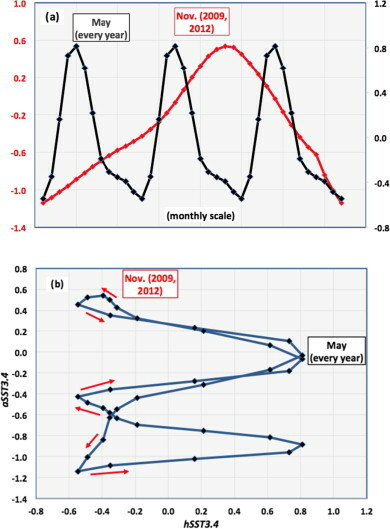 A 12-month moving average improves on a “climatology” filter in removing annual effects. 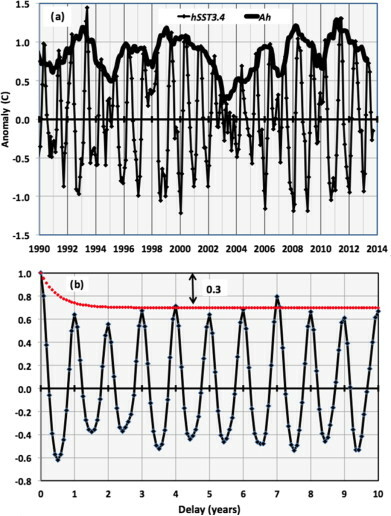 Equatorial Pacific Ocean temperature time series data contain segments showing both a phase-locked annual signal and a phase-locked signal of period two years or three years, both locked to the annual solar cycle. Three such segments are observed between 1990 and 2014. It is asserted that these are caused by a solar forcing at a frequency of 1.0 cycle/yr. These periodic features are also found in global climate data (following paper). 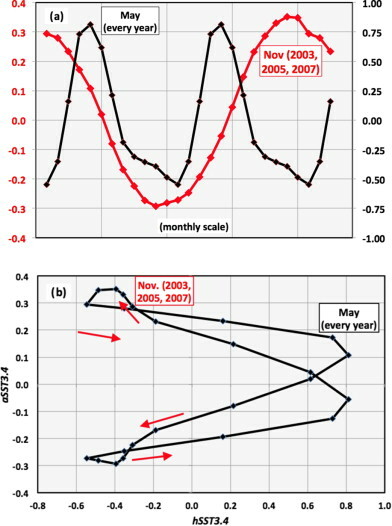 The analysis makes use of a twelve-month filter that cleanly separates seasonal effects from data. This is found to be significant for understanding the El Niño/La Niña phenomenon. 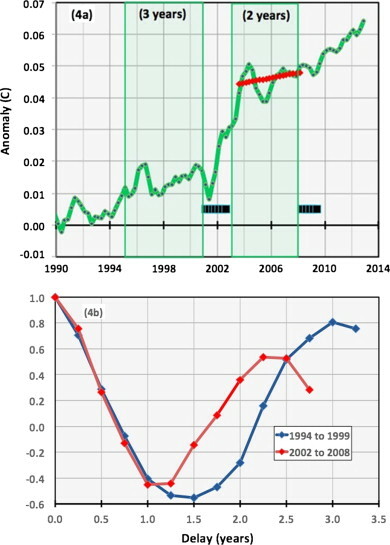 Global ocean temperatures at depths 0–700 m and 0–2000 m from 1990 to 2014 are studied. The same phase-locked phenomena reported in Paper I are observed. El Niño/La Niña effects diffuse to the global oceans with a two month delay. 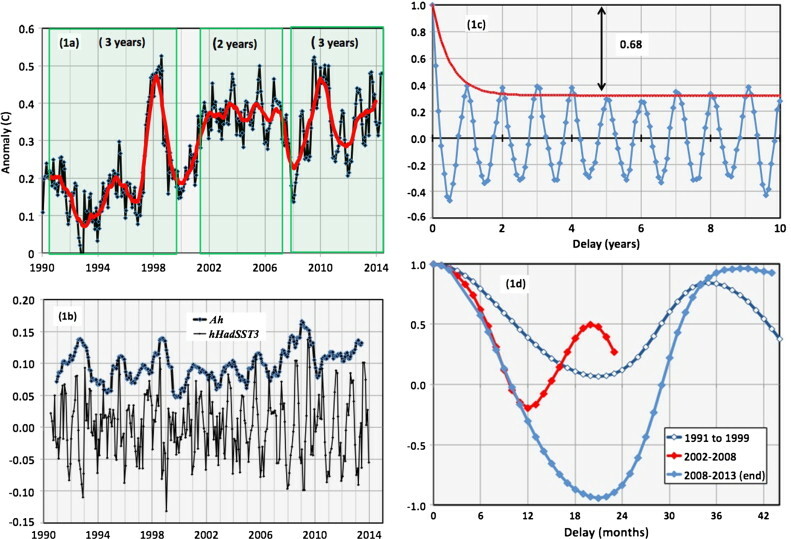 Ocean heat content trends during phase-locked time segments are consistent with zero. 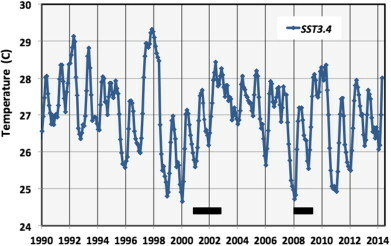 In part I, equatorial Pacific Ocean temperature index SST3.4 was found to have segments during 1990–2014 showing a phase-locked annual signal and phase-locked signals of 2- or 3-year periods. Phase locking is to an inferred solar forcing of 1.0 cycle/yr. Here the study extends to the global ocean, from surface to 700 and 2000 m. The same phase-locking phenomena are found. The El Niño/La Niña effect diffuses into the world oceans with a delay of about two months. The oceans have 1000 times higher heat capacity than the atmosphere. The tail doesn't wag the dog: The Sun controls ocean temperatures, which in turn control the atmosphere and climate.